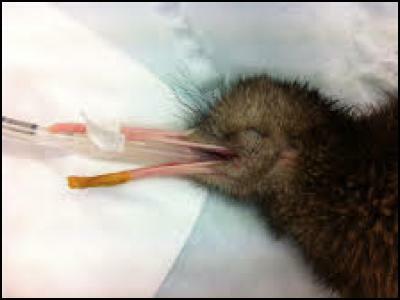 A kiwi chick born at Queenstown’s Kiwi Birdlife Park just seven weeks ago has survived all the odds to be back home and fighting fit after undergoing two rounds of surgery to correct a mal-positioned beak. The gorgeous bird, which weighs just 594 grams, hit the headlines and stole the hearts of locals when it was born at the park on October 7 fully-assisted by staff. The yet-to-be-named chick underwent a fully-assisted hatch once park staff realised it wasn’t able to hatch itself as it was mal-positioned – similar to a breach birth in humans – as it had its foot caught over its head which meant that it was unable to kick free of its shell unaided. Once born, it was also apparent the chick had a miss-aligned beak which would hinder feeding and thus inhibit the growth and potential survival of the bird. Upon hearing of the young kiwi’s plight, the team at Massey University in Palmerston North offered to assist and suggested a new technique being developed by the veterinary surgeons at the university’s Wildbase Hospital. Kiwi Birdlife Park manager Nicole Kunzmann decided to send the chick, which is part of the park’s national breed-for-release programme, north for the surgery as it was “extremely precious to the park”. Travelling courtesy of Air New Zealand in the main cabin with a seat all to itself, the chick certainly turned the heads of passengers and crew as it made its way safely back from Palmerston North. Led by Wildbase director Dr Brett Gartrell, the team performed corrective surgery on the bill tip of the kiwi with great results. “This little chick is only the third bird to have this surgery and in some ways this was the most difficult to bring back into alignment, as the tip of the lower bill had not only deviated sideways like the end of a hockey stick, but had also begun to curl upwards,” said Dr Gartrell. “It’s taken two very delicate surgeries to bring the bill tip back into alignment without damaging the sensitive blood and nerve supply that kiwi need to be able to sense food at the end of their bills. “This poor wee girl had quite a start to life and it’s been a stressful few weeks. It’s quite amazing that we now have a beautiful kiwi chick that will be fit for wild release and contribute to the national kiwi programme once she reaches 1 kilogram in weight,” said Ms Kunzmann. “The birth date was quite apt as the timing of the hatch coincided with Save the Kiwi month, an initiative by Kiwis for kiwi to raise awareness of issues facing our national emblem out in the wild,” said Ms Kunzmann. “We want to name our special kiwi with something that is fitting of her journey. We’re asking members of the public to help us choose a name by picking from one of three names the team here have chosen – Ataahua (Beautiful), Hahana (Radiant light) or Ngaio (Clever). To enter people should email marketing@kiwibird.co.nz with their favourite name choice as well as contact details. The chick’s new name will be the one with the most votes when entries close midnight Sunday December 7 2014. From the entries one lucky person will also win a Kiwi Birdlife Park prize pack worth $448.